Today I am happy to present a guest post from Maysem at Ode to Inspiration. If you like hot chocolate, I’m sure you love her recipe! With the cold season already here, we need to keep warm! What sweet way to keep warm than with a nice cup of hot chocolate! 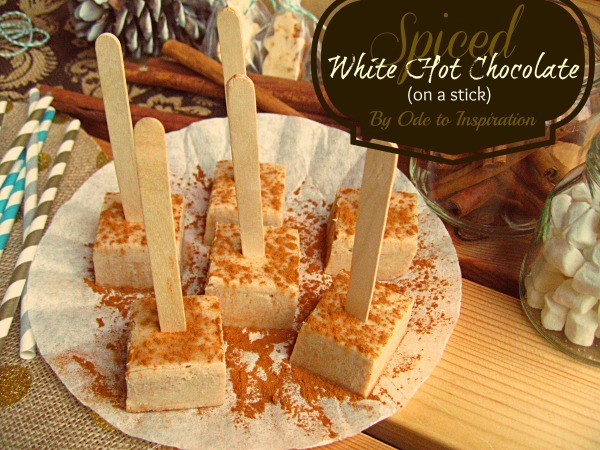 Today I’m sharing one of my favorite hot chocolate recipes… Spiced White Hot Chocolate on a stick! 1. Line an 8 x 8 dish with aluminum foil and spray it with cooking spray. Set aside. 2. Place the chocolate in a large bowl. Set aside. 3. In a small sauce pan, combine the condensed milk and heavy cream. Over medium-low heat bring the mixture to a simmer stirring frequently. 4. Pour the mixture over the chocolate and let it sit for a minute. Then stir the chocolate until it’s melted and smooth. 5. Add the cinnamon and nutmeg to the chocolate, and stir until well combined. 6. Pour the chocolate in the prepared 8 x 8 dish. Refrigerate for 4 hours or overnight. 7. 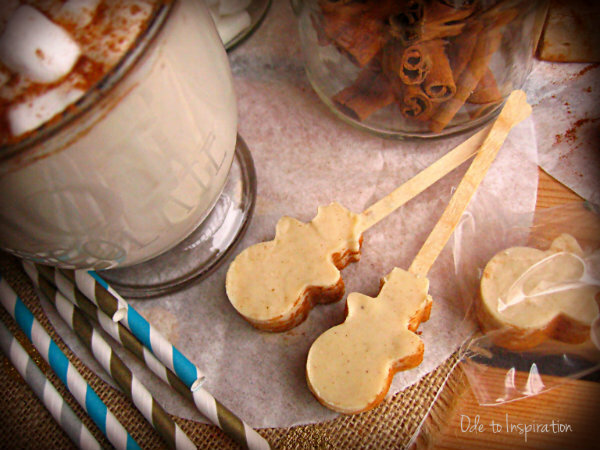 Once set, slice 25 pieces and insert popsicle sticks in each piece. Feel free to sprinkle each piece with some cinnamon. Tip: I find it easier to cut the chocolate when it’s removed from the dish. To remove, just lift the chocolate with the foil. For smooth cuts, heat a knife in a hot cup of water, wipe dry, and then cut. Wipe knife after each cut and reheat knife if necessary. When ready to serve, stir in a cup (8 oz) of hot milk. 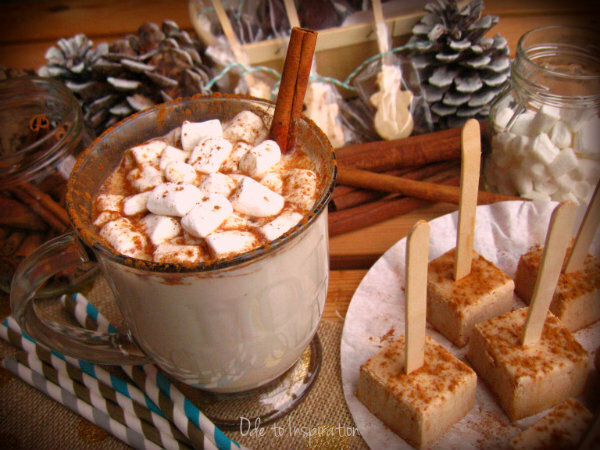 Garnish it with some marshmallows and cinnamon. Keep warm and enjoy! These can be stored in the refrigerator in a tightly covered container for up to 2 weeks. They can also be stored in the refrigerator in individual plastic treat bags. To have more fun with this recipe, use small cookie cutters or molds to create cute shapes. For cookie cutters, use a 9 x 13 baking dish instead. Lightly spray the cookie cutter before cutting. For molds, lightly spray each cavity. The little ones will love the fun shapes… us big ones too! I hope you enjoyed today’s recipe. I’d love to have you stop by Ode to Inspiration for more fun ideas. You can also follow me on Facebook, Twitter, Pinterest, and Instagram. Hope to see you around! Thanks so much to Maysem for being here today! Be sure to follow her over at Ode Inspiration!